This is about as wild of an R34 GT-R as you will ever see. Dino Dalle Carbonare posted up this awesome set of pictures on this insane R34 at Speedhunters. 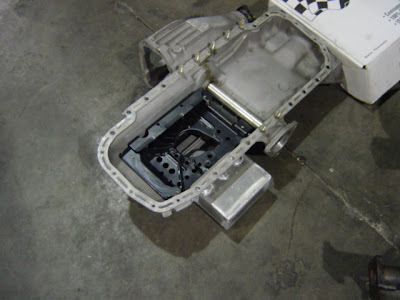 The GT-R has the front differential built into the oil pan. You may not think that is much of a deal, except when trying to move the engine back as much as the Prostock car. The gold shaft running though the pan is the tube that contains the jackshaft for the left side axle. For about the last 3 years, this car has looked really similar to this. Hopefully they can eventually get this thing out onto Tsukuba , where it belongs.